CarGurus has 35,563 nationwide Tahoe listings starting at $950. The 2010 Chevrolet Tahoe gains a favorable reputation for its strong towing ability, slick-shifting transmission, three-row seating capability, roomy cabin, and notably comfortable ride. Tepid interior materials, a cramped, non-folding third-row bench seat, and awkward placement of some controls don’t contribute to the Tahoe’s reputation. Refinement, though not usually associated with an American-made full-size SUV, aptly describes the 2010 Chevrolet Tahoe. This full-size Sport Ute earns this distinction with better-than-average handling, a well-conceived cabin, and more than its share of style points. The Tahoe always was and still remains a solid choice for those who think big. Roomy and comfortable, muscular and suave, the 2010 Chevrolet Tahoe is, arguably, the more refined of GM’s full-size SUV offerings. But refinement, of course, usually means expensive, and the Tahoe, even in its base trim, doesn’t come cheap. In any case, after a significant redesign in 2006, Chevy has decided to pretty much stand pat with this five-door, seven-to-nine-passenger Sport Ute, though engine choices have been reduced to only one, and front side-mounted airbags, as well as a USB connection, are now standard across the lineup. The 2010 Tahoe is delivered in three trim levels, the base LS, LT, LTZ, and Hybrid. Each trim is available with either rear-wheel drive (RWD) or four-wheel drive (4WD), and all offer three rows of seating. With the rear seats folded or removed, 109 cubic feet of cargo area make life easier when loading up for that home improvement project. Creature comforts, appearance features, and safety equipment are all plentiful in the 2010 Tahoe, but this is not a commuter car, nor is it the most nimble of vehicles despite a notably tight turning radius, optional parking sensors, and an available rearview camera. Built on the same truck-based chassis as its kissing-cousin Chevy Suburban, the hefty Tahoe goes through gas like Sherman through Atlanta, displays a reluctance to sprint from a stop, and lacks the braking power that it ought to have. For 2010, only the 5.3-liter V8 engine is available for the conventionally powered Chevy Tahoe. 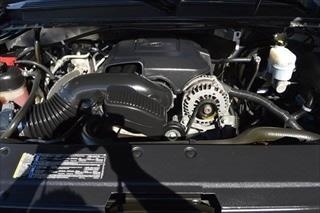 This engine features Flex Fuel, E85-capability (FFV), as well as variable-valve-timing (VVT) and cylinder deactivation. When managed by the standard six-speed auto-manual transmission, this potent V8 puts out 320 hp and 335 lb-ft of torque, giving the RWD Tahoe 8,400 pounds of towing capacity, when properly equipped, and 8,200 pounds for the 4WD trims. EPA-estimated mileage is 15/21 mpg for the RWD Tahoe and 14/20 for the 4WD. A 6.0-liter V8 powers the Tahoe Hybrid, but it’s been tweaked to work with a two-mode hybrid/electric system in producing 332 hp and 367 lb-ft of torque when managed by a standard constant-velocity transmission (CVT). A 120kw electric motor uses a nickel metal hydride battery as well as regenerative braking to provide fuel-saving electric locomotion and automatic engine shut-off/start-up, in addition to the ability to power the Tahoe from stop-light to stop-light on electric power alone. Acceleration with the 5.3-liter V8 is described by most professional reviewers as tepid at best (0-60 in 8.5 seconds), but merging and passing power is better-than-adequate when only a moderate load is carried. As well, the standard six-speed auto-manual transmission is described by nearly all reviewers as one of the slickest-shifting gearboxes on the market. The Tahoe Hybrid is claimed by most professional reviewers to equal its conventionally powered siblings in merging and passing capabilities. A few reviewers, however, mention a noticeable surge when switching between gas and electric-only modes. All 2010 Chevy Tahoe trims sport a long-and-short-arm independent front suspension, front and rear stabilizer bars, and a multi-link rear end. The Tahoe LS and LT ride on 17-inch alloy wheels, the Hybrid rolls on 18-inchers, and the LTZ boasts 20-inch alloys, as well as an active self-leveling suspension. Professional reviewers agree that the Tahoe gives a notably smooth ride over uneven pavement, especially with the 17-inch tires. Most reviewers note a bit of wallow on wavy roads, but no harsh jarring. According to many reviewers the LTZ trim, with its standard Autoride self-leveling suspension, quells some float, but otherwise contributes little to overall ride quality. The Tahoe Hybrid, sporting fuel-efficient friction-resistant tires, rides a tad stiffer, but still features a comfortable driving experience. Considering this big Ute’s heft and truck-based chassis, nimbleness is not expected to be a strong point. Reasonable alacrity in response to steering commands, however, and a better-than-average turning radius make, according to reviewers, for a far more responsive vehicle than its size would indicate. Professional reviewers describe the Tahoe’s body-lean in tight cornering as manageable, with less noseplow than much of its competition. Reviewers also note strong braking performance with the Tahoe, though pedal feel could be better. The on-demand 4WD Tahoe trims benefit from auto-locking hubs, electronic hi-lo gear selection, and a mechanical center differential. If the Z71 Off-Road Package is opted for, 18-inch all-terrain tires, a specially tuned suspension, and skid plates make a journey up the face of Old Smokey the proverbial walk in the park. Loaded to the gills, the 2010 Chevy Tahoe offers such basic standard amenities as a roof rack, trailer hitch with wiring, nine-passenger seating capacity, power windows, door locks, and heated outside mirrors, cruise control, and a single-CD player with six speakers. 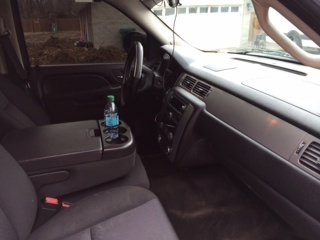 Besides all this, the base Tahoe LS features such uncommon additional standard goodies as a power-adjustable driver’s seat, premium cloth upholstery, dual-zone air conditioning, rear air conditioning, tilt-wheel steering, leather-wrapped steering wheel, a USB connection, and OnStar telecommunications technology. Options include the Interior Plus Package with tri-zone climate control, front power-adjustable bucket seats, a front center console, and Bluetooth communications technology, and the Convenience Package with rear parking sensors, rearview camera, power-adjustable pedals, and remote starting. In addition to including all the LS trim’s available Interior Plus Package as standard equipment, the eight-passenger Tahoe LT also adds leather upholstery and OnStar navigation, while offering such options as the Luxury Package, including a power liftgate, eight-way adjustable front seats, driver memory settings, and power second-row seat release, and the Z71 Off-Road Package. The Tahoe’s top-shelf, seven-passenger LTZ trim makes the optional Luxury Package standard while throwing in multilevel-heated front- and second-row bucket seats and Bose premium audio with ten speakers. Power-retractable step running boards and a blind-spot warning system are optional for the LTZ. The Tahoe Hybrid, meanwhile, splits the difference between the LT and LTZ trims as far as standard features are concerned. Further stand-alone options for the entire Tahoe lie include a power sunroof, rear-seat DVD entertainment, and DVD touch-screen navigation. Traditionally regarded as one of the roomier Sport Utes on the road, the 2010 Tahoe maintains the tradition, and throws in loads of cabin storage space besides. Gauges and controls are described by reviewers as well-placed for the most part, though many could be improved in their readability, especially in bright sunshine. Wind and road noise are adequately dampened on the conventionally powered Tahoe trims, though a non-intrusive electric whirring can be discerned when accelerating or slowing the Hybrid. The 2010 Chevy Tahoe boasts such standard safety items as four-wheel ABS with electronic brakeforce distribution, traction and stability control, newly standard front side-mounted airbags, front, second-, and third-row head airbags, dusk-sensing, auto-delay headlights, daytime running lights, and the OnStar post-collision safety system. Fog/driving lights, signal-integrated exterior mirrors, and rear parking sensors are either available or standard. The Insurance Institute for Highway Safety (IIHS) has not tested the Chevy Tahoe, but the National Highway Traffic Safety Administration gives the 2010 Tahoe five stars in front impact testing and three stars in rollover testing. 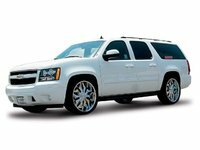 The Tahoe offers considerable passenger protection just with its hefty size and sturdy frame. 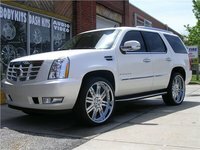 With almost no owner feedback yet available on the either the conventionally powered 2010 Chevy Tahoe or the Tahoe Hybrid, owner comments regarding the similarly equipped 2009 Tahoe trims will have to do. In any case, owners, though generally regarding the Tahoe as roomy, versatile, and capable, have complaints regarding its acceleration, braking, and cramped third-row seating. Some owners grouse, as well, about the Tahoe’s assembly quality and tepid cabin materials, while reliability issues with the ’09 Tahoe Hybrid have caused some additional grumbling. A number of owners would prefer fold-down third-row seats to the heavy and awkward removable seats currently available. Additional rants from owners include the Hybrid’s hefty price tag, the lack of available reclining second-row seats, and, curiously, considering its spacious interior, a perceived dearth of cabin storage space. 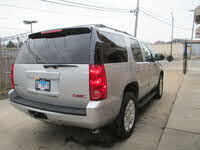 On the positive side, virtually all owners of the ’09 Tahoe find its styling, safety, and ride more than praiseworthy. Also garnering a major share of kudos is Tahoe’s smooth and potent six-speed auto-manual transmission, its semi-reasonable base price – at least for the base, non-hybrid LS – and such individual features as the Bluetooth communications system, standard dual-zone air conditioning, and the available multi-level heated front and rear seats. The Tahoe’s surprisingly adept handling characteristics also earned a number of favorable comments from owners. What's your take on the 2010 Chevrolet Tahoe? Users ranked 2010 Chevrolet Tahoe against other cars which they drove/owned. Each ranking was based on 9 categories. Here is the summary of top rankings. 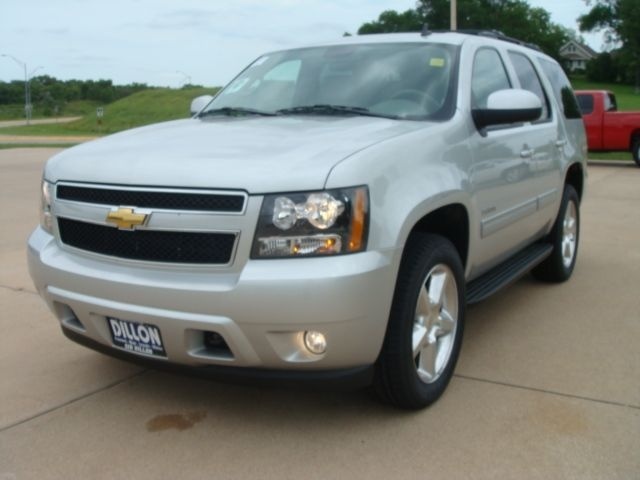 Have you driven a 2010 Chevrolet Tahoe?